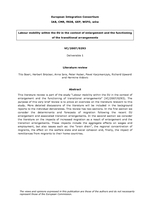 This literature review is part of the study "Labour mobility within the EU in the context of enlargement and the functioning of transitional arrangements" (VC/2007/0293). The purpose of this very brief review is to prove an overview on the literature relevant to this study. More detailed discussions of the literature will be included in the background reports to the individual deliverables. This review has two sections. In the first section we consider the determinants and forecasts of migration following the recent EU enlargement and associated transition arrangements. In the second section we consider the literature on the impacts of increased migration as a result of enlargement and the transition arrangements. These impacts include the aggregate effects on wages and employment, but also issues such as: the "brain drain", the regional concentration of migrants, the effect on the welfare state and social cohesion and, finally, the impact of remittances from migrants to their home countries.